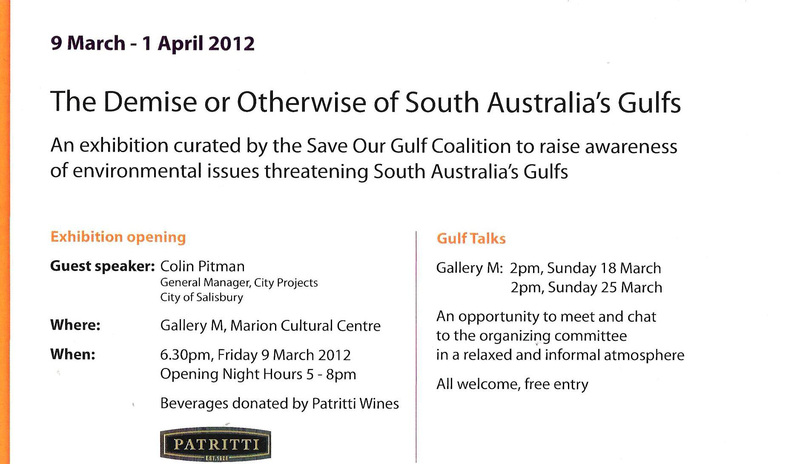 This was from an art exhibition opening at Gallery M here is South Australia called The Demise or Otherwise of South Australia’s Gulfs, curated by Save Our Gulf Coalition. Over ninety artists had been invited to take part and a number of them are high profile. The diversity is enormous and with every medium allowed ranging from jewellery, photography, textiles, sculpture and of course paintings. 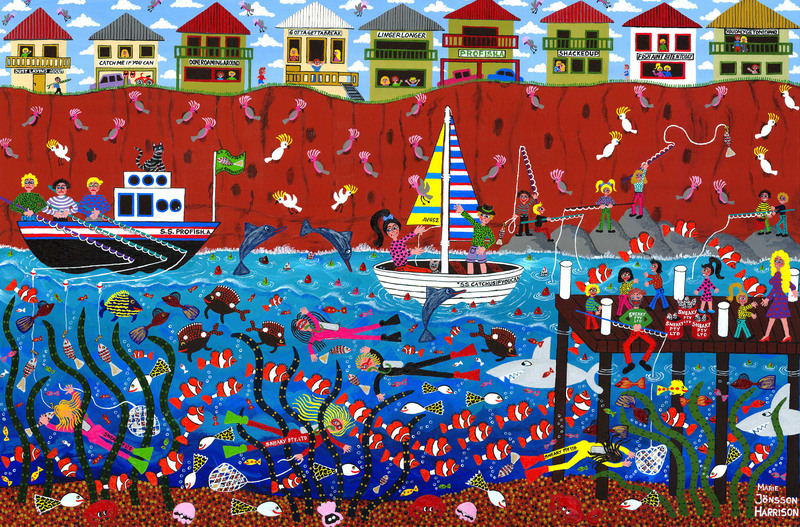 The above Giclee print was my contribution called “Catch me if you can” where everybody are happy and having a wonderful time in a perfect ecosystem with clear blue water with healthy and abundant sea life. Although I do have to admit, I myself would like my visit to the seashore a little less crowded than I have depicted it here, lol, and funny about that! The artists in this show had been asked to submit work that reflects their own interpretation of the possible future effects on our fragile coastal and Gulf waters, either the beauty or the loss of beauty of the environment and the wild life. The group themselves; Save Our Gulf Coalition joined forces in 2008 to protest against the then proposed desalination plant in Port Stanvac. Their aim was to stop desalination plants from going ahead in the inappropriate locations in South Australia and they are not affiliated with any political party nor receive funding from the government or businesses. This intern they hope would help to reduce gulf pollution and promote storm water harvesting and waste water recycling. My husband is very concerned about the desalination plant and is sure the extra salt that will be pumped out to sea will kill off any fish and sea creatures in the immediate vicinity. The Save Our Gulf group view is that the gulf is a delicate environment and is being used as a giant garbage dump for industrial waste, chemicals, storm water and treated sewage and that the dumping of enormous volumes of hyper-saline brine will push the fragile marine ecosystem beyond its limits. It actually is quite amazing to watch where the water from the river enters the sea after a big rain, for hundreds of meters out to shore the sea becomes the color of mud instead of blue. It does make more sense to try to harvest the rain water I would have thought. So it is hoped that this exhibition will not only highlight some of the negative factors but also show some of the unique beauty of the South Australian aquatic life and coastal landscapes. “Catch me if you can” is also available as a free e-card, I would love you to used it for an environmental message of protest and also as a “I wish you were here” card whilst on holiday of course.